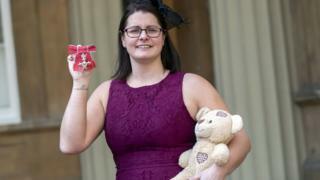 A health campaigner whose son died of sepsis carried his ashes in a teddy bear as she visited Buckingham Palace to collect an honour. Melissa Mead’s son William died of blood poisoning following a chest infection in 2014. She was presented with an MBE by the Prince of Wales for services to raising awareness of the disease. Ms Mead, from Penryn, Cornwall, said her family, who also attended, were “really, really proud” of the honour. She said: “It is very bittersweet for everyone because we wouldn’t be here if William hadn’t died, but I know that he lives on in the thousands of lives that he has saved and that is the best that anyone can do. “I wouldn’t have been here and done any of this if it hadn’t been for him giving his life. William died at 12 months old in December 2014 of blood poisoning following a chest infection, which could have been treated with antibiotics. He had been ill for six to eight weeks before he died and had been seen by GPs six times before his death. About 44,000 people die from sepsis every year in the UK. Speaking after the ceremony, Ms Mead said: “This is a wonderful way to be honoured, but the best way to be honoured is to be his mum. “I am more proud of that than I am anything else.